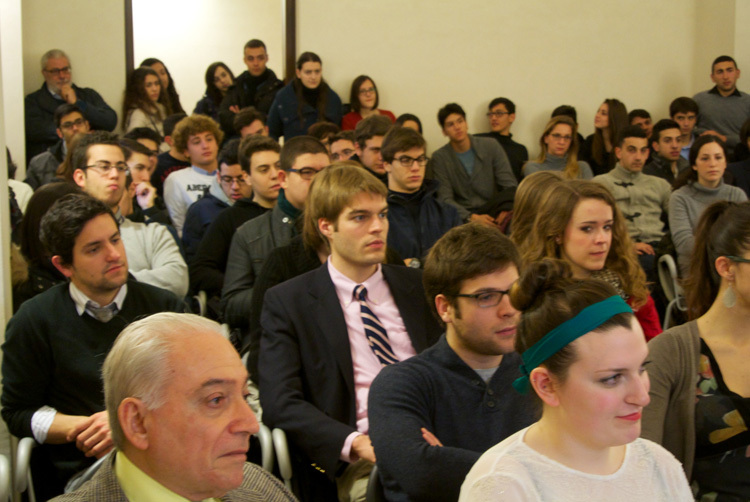 The “American Day”, a day wholly dedicated to American culture and cultural exchanges with Italy, organizes by the Liceo Scientifico Cosimo De Giorgi in Lecce at the beginning of this year, was a great success. English Teaching Assistants, or ETAs, winners of “Fulbright” scholarships, who are spending a year in Italy, came from numerous Italian cities like Florence, Rome, Cosenza, Gubbio, Naples and even Norway, to take part. 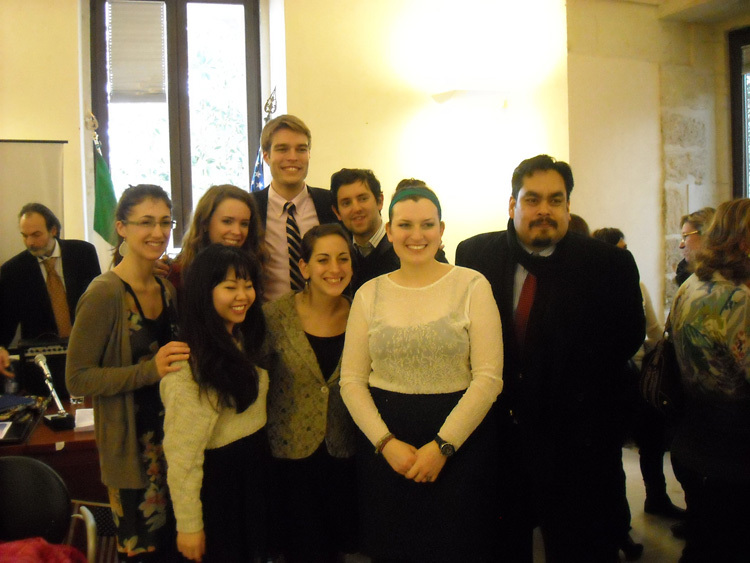 Those present were: Lindsay Paiva, Andrea Leone, Elyse McLaughlin, Tiffanie Bui, Nicholas Crown, David D’Antonio and Mattea Cumoletti, who is working as an English Teaching Assistant at Liceo De Giorgi in Lecce. Their brief but brilliant contributions dealt with a wide range of themes: from their home towns to the history of jazz, from their favorite American football teams to problems of teaching methodology. The meeting was attended by the School Principal, Giovanna Caretto, Patrizia Sanguedolce, the teacher who organized the event, and also Consul James Rodriguez, Culture and Press Relations of the Consulate General of the U.S. in Naples. 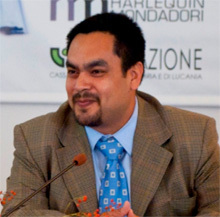 Born in Washington DC, his family originally comes from El Salvador. He is in Naples with his wife and three daughters and is highly appreciative of Italian culture and cooking. We asked him some questions about the “Fulbright Project”. Could you briefly explain how the “Fulbright Program” was born and how it is structured? This year how many winners are there in Italy, in which cities do they work and how was the destination “Italy” assigned to them? In Italy, we have six ETAs stationed in Gubbio, Lecce, Napoli, Palermo, Roma, Cosenza. They give their preference on the geographical area, and then according to the selected schools we match them. ETAs are a hot commodity and we are happy to provide them. Which criteria were used to select the schools? We work in conjunction with the Ministry of Education to select schools that have a track record of academic excellence and good students. The schools need to be able to benefit from having a native English speaker working there. In addition, we look for schools that will be receptive to hosting an ETA and providing them with any necessary support. You are about to end your diplomatic tour here in Italy. What’s your review of this experience? Working in Italy has been a long-time dream of mine. In fact, I turned down the same position – Public Affairs Officer – in Melbourne, Australia to work here. Italy is one of the most sought after countries for people in the diplomatic service. As far as Southern Italy in particular, I just love the culture, the people and the food. There are so many opportunities to see historical sights and landmarks. It has been amazing! I have met some very impressive people who work hard to improve Southern Italy, economically speaking. Southern Italy, in particular, is really inspiring. While I’ve been here, I hope that I have improved my Italian. Overall I had a great experience. I will leave Italy with nothing but good memories and a hope to return in the near future. What were your impressions during your visit in Lecce? Lecce is a beautiful little city. I completely understand why it is called “Southern little Florence.” Salento in general is wonderful and the people in Lecce are so lucky that every morning they can choose which sea to go to. Plus, the city is surrounded by beautiful olive trees. I had a chance to visit an olive farm while I was there and the olive oil might just be the best in Italy, if not the world. Salento is amazing and I hope to make it back soon.